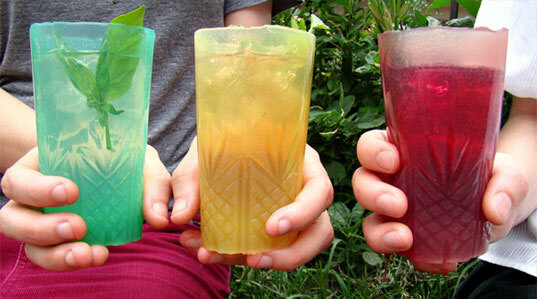 Wiggly Cups Made of Jello Are Biodegradable and Edible! We’ve been touting biodegradable tableware for some time now, but these wiggly cups made of Jello take things to the next level! Conceived by design consultancy The Way We See the World for the 2nd annual Jell-O Mold competition hosted by Gowanus Studio Space, the squishy cups are actually made of agar agar and come in yummy flavors like lemon-basil, ginger-mint, and rosemary-beet. When you’re done drinking from your Jello cup, just chuck it in the grass (agar agar actually nourishes plant life) or dispose of it in a more enjoyable fashion – eat it! To Veghead. Dude, Agar is a SEAWEED EXRACT. Not an animal. Cheers. very very clever well done. Veg head think before you speak,agar agar is from seaweed or algae that is why it will feed the garden. So does everyone understand that Jell-o is made from animals? The main ingredient is from an animal and most eco-friendly people are also animal friendly people! So maybe next time when someone wants to be eco-friendly please think of the animals!!! We've been touting biodegradable tableware for some time now, but these wiggly cups made of Jello take things to the next level! Conceived by design consultancy The Way We See the World for the 2nd annual Jell-O Mold competition hosted by Gowanus Studio Space, the squishy cups are actually made of agar agar and come in yummy flavors like lemon-basil, ginger-mint, and rosemary-beet. When you're done drinking from your Jello cup, just chuck it in the grass (agar agar actually nourishes plant life) or dispose of it in a more enjoyable fashion - eat it!